Last night, 24 August 2018, was the opening night of what is likely to be my last exhibition for the year. I am part of a quartet of photographers showing Point of View, a group exhibition located at Photospace Gallery on Courtenay Place in Wellington, New Zealand, until 15 September. It was a fun evening with a good 50-60 people coming along for the two hours of the opening, including one of my portrait sitters, my local MP and friend, Paul Eagle. Lots of great conversations too, including people wondering what paper I had used to print two sets of my photos on to, as I had omitted to include that detail on my information about the sets. Fortunately, the excellent printer I use, Oliver Zavala from Picaflor Fine Art Printing, was on hand with the information. It is called German Etching: and it performed really well for the grey scales of my urban landscapes set, as well as the deep blacks for my portraits. I'll post each set into its own set on my online gallery in the next few weeks. Do come along and have a look if you get the chance. It's been a busy year in terms of engaging with my photography practice. With what is my third, and most likely final exhibition this year, I am please to announce that I have 32 photos as part of a group exhibition at Photospace Gallery from 24 August to 15 September, 2018. My work will encompass three different themes, the urban landscape, social documentary, and portraiture. The body of portraiture work I will be showing is a series of photographs of people connected to our home in Wellington. The people portrayed are friends, family and neighbours that visited our home over a two-week period in July and August, 2018. For my social documentary set, I chose to make photographs at a charity shop in my neighbourhood. Op Shops serve a critical social function in New Zealand, selling second-hand donated goods at low-cost to raise money for social enterprises and charity. More often than not, staff in these shops are volunteers, donating their times to sort through the community donations, and serving people who come in to buy things. For this series, I wanted to document my local Op Shop in Wellington and the staff that volunteer there. Though part of a bigger operation, it is a small shop and very popular in my neighbourhood. My urban landscape collection reflect upon my journey since moving to New Zealand some 12 years ago. When I first moved here, I hadn’t ever lived anywhere much other than a big city, other than a few months in an English or Welsh village here and there, and some time in village India when I was a child. I remember a feeling in New Plymouth in 2005 on a Saturday afternoon when the shops would start closing up and the hustle and bustle would vanish into the approaching night: some kind of emptiness. These photographs were taken from a bus seat, traveling from Wellington to Whanganui on a Saturday afternoon. I needed to get there to pick up our car that had broken down a couple of weeks before, ironically, trying to get back home from New Plymouth. When I showed these photographs to people, I admit that I hadn't heard about Peter Black’s Moving Pictures photographs, and I had never seen them. People told me I should, so I did. Over 30 years after Peter made his images, my feeling is that although time moves on, other things don’t appear to. Please come along to the exhibition, and it would be great if you could come along to the opening night too. Last Thursday evening, I was really quite nervous as I waited for people to arrive for the opening of my first solo exhibition. 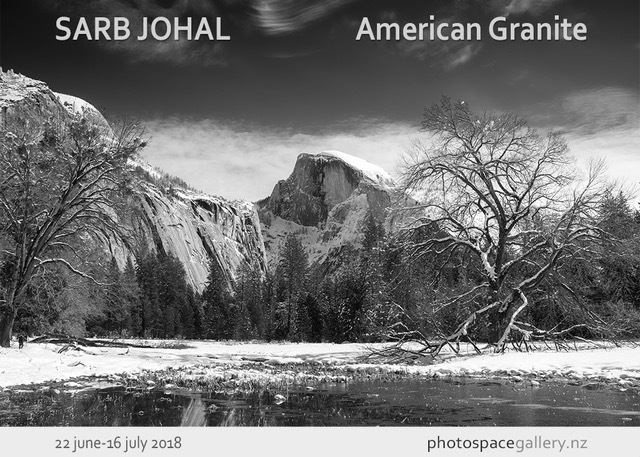 With the support of a US Embassy Public Diplomacy grant and printing support from Fujifilm NZ, I put together a selection of images I made from Yosemite National Park in Central California last year. I'm so grateful for the excellent turnout of support on the evening, and from the lovely feedback I have received from people who have gone to see the exhibition after the opening night. It continues until 16th July, and I will be giving a public talk next week on the 6th July. Please go along and take a look, and even come along to the talk if you can. Really pleased to see this morning that my market street shot, 'Waiting for the Greens' got another judge commendation in a Photocrowd.com 'Close-up bland and white candid street photography' competition. It didn't do badly in the crowd voting either, finishing in the top 10%. Check out the competition and the results here. It's interesting that the judge comments how many people didn't stick to the brief, but were popular with the crowd anyway, and he laments this fact. I'm really pleased to write that one of the images I entered into the Street Markets contest on Photocrowd.com received a commendation from the expert judge for the competition. "Street markets are sensory overloads of colours and shapes and spices – all combining to form an exciting and condensed snapshot of human life. Choosing what not to leave out can be just as important as choosing what to include here. Choose a point of interest and compose the scene around it. Good luck!" It's been a great week with some of the photos that I have made being recognised in various forms around the world. It's really quite exciting and rewarding to get that kind of feedback - especially from expert judges. Big week coming up next week - but that will be all about learning and creating. First week of the Portrait Module in my Photospace 3 journey, and also off to Australia to join the photography team shooting TEDxSydney. I can't quite believe it, but my first gallery exhibition opens later this month. 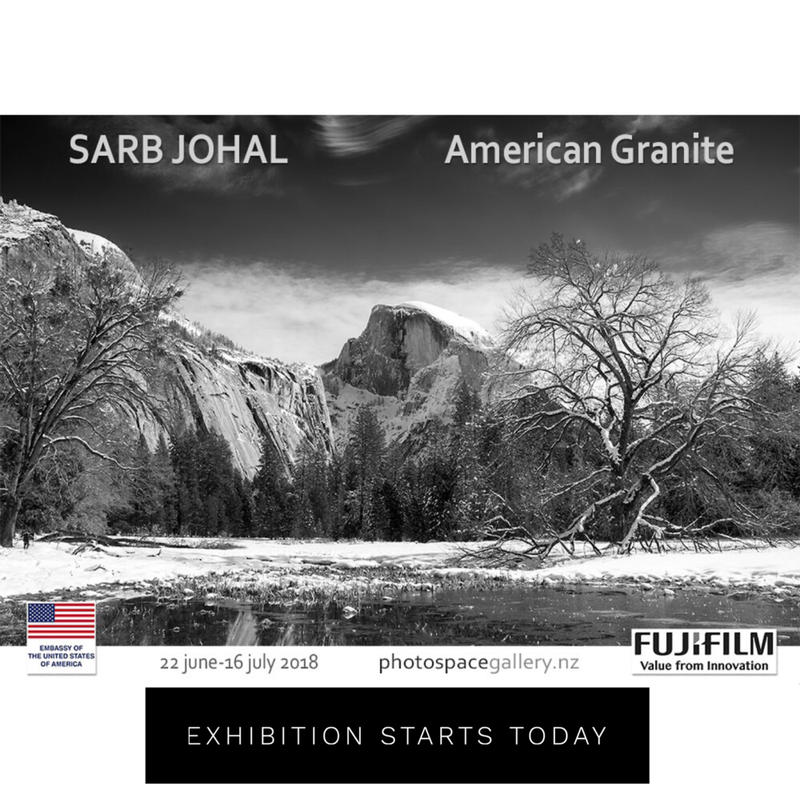 American Granite will run from June 22 - July 16 at Photospace Gallery on Courteney Place in Wellington, New Zealand. There is a view that taking photographs of objects and scenery somehow interferes with our enjoyment or experience of being in the moment, especially when we are out in the wilderness. How often have you heard people urge others to put the camera down and just 'be in the moment'. I even say it to myself (with some justification) on occasion. However, the reality is more nuanced than this one-sided view. Taking photographs can also heighten our sensibilities and sensitivity and increase our engagement in our experiences. For me, walking around a snowbound Yosemite National Park in January 2017 was a truly wondrous experience. Sarah and I were amongst the last to be admitted into the Park for two days as the snow mounted up and transport options both into and out of Yosemite became difficult. Many of these photographs in this exhibition were made wandering around with a Park Ranger in sub-zero temperatures one morning. I went back to my room so cold, that I couldn’t actually move my fingers for a few minutes. I remember nervously checking my camera memory card that my fingers were working well enough in the field, that I had actually pressed the shutter when I thought I had. My exhibition will also be supported by a public lecture on 6th July (6.30pm) at Wellington Central Library, Mezzanine Floor, entitled 'Does photography ruin our enjoyment of wilderness experiences?' I'm looking forward to talking about that too. I've linked the Facebook event pages for both the exhibition and the public lecture too. It'll appear on Eventfinda too in the next week or so, so I'll put that link up too when I get the chance. Please note the dates in your diary and come along. And for those of you that can't make it to Wellington to see the whole thing, I'll put up an online gallery for you to enjoy once the event is over. I'd also like to acknowledge and thank the US Embassy in New Zealand for awarding me a Public Diplomacy Grant to support this exhibition. Of course, I make photographs because, well, I like making photographs. Forgive me if this seems somewhat circular, but it's difficult to distance oneself from a practice that has been so ingrained for so many years, becoming an unconscious reflex. These days, that reflex is to grab my phone when I'm in a situation where it feels like an interesting image may be about to present itself. I'm trying to train myself out of that more recent reflex development, by providing an alternative pathway to an actual camera I try to have at hand. I use photography as a means of exploring the relationship between people, place, and behaviour. Drawing on my 25 years or experience as a psychologist helps me to frame my images and the people and place that I photograph. Often, I won’t know what has drawn me to make a photograph of a particular image. And more often than not, I discover something else as I process and actually physically print out that photo too. Photography helps me to explore the hidden understandings of my character, the knowledge I bring, and the world I live in and how they all come together in the creation of a photograph. On the 7th April, 2018, I joined over 4000 participants from 850 cities in 104 countries around the globe, all documenting their cities and stories over the 24 hour period in this street photography project. It was a new experience for me, and another angle was that I was the NZ Ambassador to the project too. I managed to get the story picked up in a couple of local newspapers, but when I pitched it to a couple of radio shows, they didn't seem all that interested, which is a pity, especially when I compare it to the pick-up it got in other cities around the world. Nevertheless, there was a good size group of people participating in the project for New Zealand, mainly based in Auckland, but also in Christchurch and Wellington, and there may be others I don't know about. Here's six of the pictures I took, and a little bit about each one. This photo was taken in Cuba Street at in the early morning outside the Bristol Hotel, using my Fuji X-T1 and 35/1.4 lens. The duo playing were having a bit of trouble getting attention from the crowd, as they'd only just started and people were pretty loaded. So they were trying to have a bit of fun, and this guy was clearly amused as he walked past. A bit of fun as the evening turned into night. Of course, as the night went on, the work didn't stop. Part of the project was designed to document humanity as they went about their daily life in their city. In this photo, I noticed the worker starting his shift clearing up after other people's fun. He did his work purposefully and at speed - one of an army that carries its work out mostly unseen to make sure that our city functions as well as it does - and it mostly does here in Wellington, I'm pleased to say. One of the lovely things about Wellington are the little things that people do to make our city a softer, more interesting place. In this case, clearly someone had woven little patterns of cotton to decorate this city bench to make it more inviting and colourful to sit on. It's still early morning, but at this point, I headed home as I had a full day of work to prepare for, even though that's unusual for me these days it being a Saturday. The next morning, I changed camera to my Fujifilm X100 (the original version) and took a trip to the market on my way to my meeting. I captured this image of a woman doing her shopping - she was actually comparing produce and something had clearly caught her eye as I pressed the shutter here - just another thing we have to do in order to live our lives, and a task that mostly women do in our families - not always, but mostly. And as this project's theme this year was to document the lives of women in our cities, I thought it worth focusing on and including. 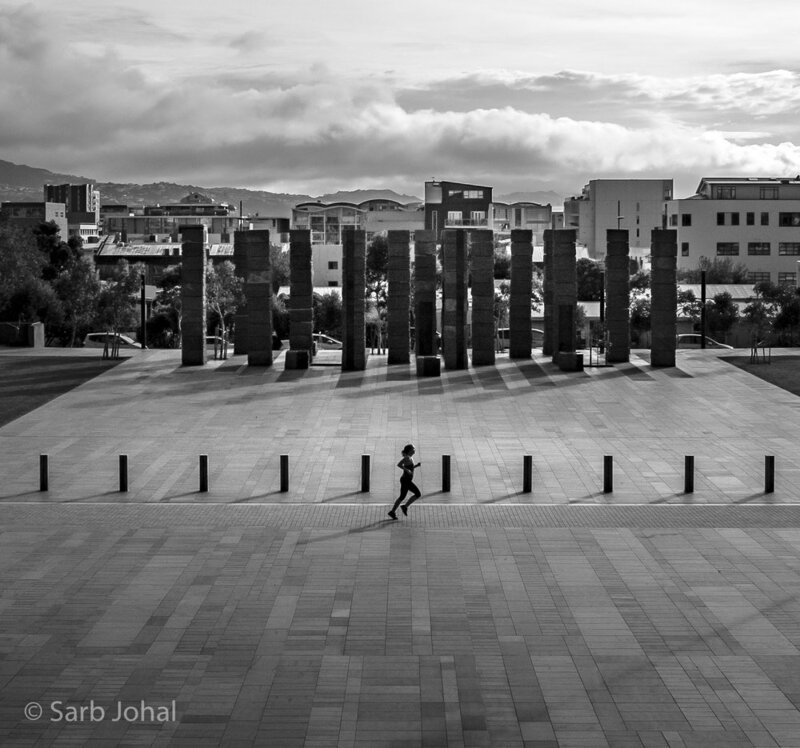 This image captures a young woman running though a War Memorial here in Wellington. For me, the symmetry caught my eye, as well as the symbolism of a woman taking care of herself in a space that was dedicated to sacrifice and honour, as well as the tragedy and horror of war. Finally, these two young women were representing TheRockFM radio station at the Homegrown music festival happening in the city that evening as I made my way home from the meeting I'd been at all day. The atmosphere was races, loud, but good-natured - but it was still early on. I didn't stick around to see what happened next. In case you're interested, here's some of the blurb about the project and a link to their website: "We connect emerging photographers, aspiring photojournalist and visual storytellers from every city of the world to document humanity and make a difference by raising awareness about global issues and empowering NGOs.Participants share one photo per hour during twenty-four hours. On one single day we get to see the world from a different point of view, humanity documented by local photographers. Through the 24HourProject’s mission, values and global exhibitions, the project reaches millions of individuals annually showcasing the human connection of images and real live stories."